The gibbous, effervescent spaceship, girdled by pale pink smears, streaked across the luminous azure sky like it was the most natural thing in the universe for it to do. “I still don’t understand why they’d do that,” Clark replied. With that, the mild-mannered reporter stepped into the men’s, ripped off his suit and tie, streaked into space, and dispatched the Geebee fleet to parts unknown. And everyone lived happily ever after. Unfortunately, including the three televangelists. 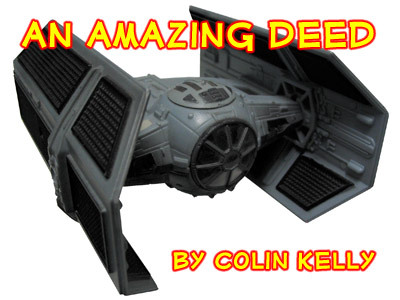 This story and the included images are Copyright © 2008-2011 by Colin Kelly (colinian). They cannot be reproduced without express written consent. It's easy: just click on the email link at the bottom of this page to send me a message. Say “Hi” and tell me what you think about An Amazing Deed. Thanks.